For the Grilled Quail: Pat the quail dry with a paper towel and place in a large zip bag. Add the garlic, shallots, herbs, spices, brown sugar, olive oil and salt. Gently rub the quail with the herbs and spices. Zip the bag and refrigerate for 1 hour to marinate. For the Apple Butter BBQ Sauce: In a heavy bottomed sauce pot, sweat the apples, shallots, and garlic in butter over low heat for 5 minutes. Add the chicken stock, Dijon mustard, vinegar, and chipotle pepper. Bring to a boil and cook until reduced by half, then add in the apple butter and bring back to a boil, stirring constantly. Remove from heat and season with Worcestershire and lemon juice. Add salt if needed. Puree in a blender or with an immersion blender. Strain with a fine mesh strainer. Preheat the grill to high heat. 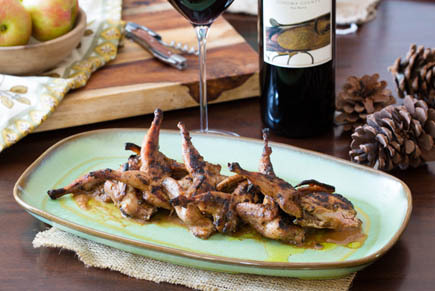 Pull the quail out of the marinade and place on the grill. Cook for two minutes, then gently flip the birds and grill an additional two minutes. Remove from the grill and brush the apple butter barbecue sauce on the quail. Right before you are ready to serve, place the quail on a baking sheet, and place under the broiler until the sauce starts to bubble.